Jolly Roofing is proud to offer the most comprehensive inspection and maintenance program in the industry – Roof Secure. Roof Secure utilizes GPS-driven technology and streamlines the way we collect, manage, and present your roof information. Initial roof inspection is performed (Roof manufacturers require this annually to maintain a warranty in good standing). We then report any current deficiencies and areas where there might be some future concerns. This is reported via GPS with photos, drawings, and maps. Deficiencies are categorized as either “Remedial”, “Emergency”, or “Monitor”. Deficiencies are also categorized under “Warranty” and “Non Warranty”. For warranty issues we request a PO# from the roof manufacturer and repairs are billed directly to them. Non-warranty work is discussed with you to determine how to proceed. Sometimes non-warranty repairs are caused by other contractors (i.e. HVAC techs). Roof Secure allows you to easily delegate responsibility for those repairs. Roof is given an overall grade, A-F. “A” if it’s in excellent shape. “F” if it needs replacement. Everything in between is given a timeframe for estimated life remaining. Roof system will be classified accordingly – “Monitor”, “Repair”, or “Replace”. Core sample is performed with client permission. You are given log in credentials, where you can view all photos, roof maps, etc. 24/7. You can also schedule service with us through this portal. You won’t need to worry with reporting warranty repairs — Just log in, click service, and we handle everything from there. What Are the Advantages of Utilizing Roof Secure Software? Current deficiencies plotted on satellite roof map. Deficiencies are differentiated as “WARRANTY” or “NON-WARRANTY”. WARRANTY: A PO# is requested from the manufacturer and those repairs are completed at no cost to you (Manufacturers only make emergency active leak repairs and will monitor other items). NON-WARRANTY: Repairs are separated out – “REMEDIAL”, “EMERGENCY”, and “MONITOR”, allowing you to pick the repairs you want performed based on severity and cost. Current roof condition is provided. Roofs are given a grade between A-F. Photos of every minute detail. Report is easily turned into a PDF file to print out when hard copies are needed. 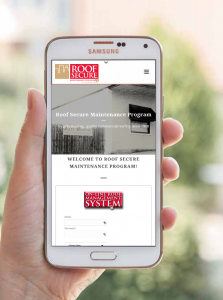 You are given log in credentials to access the Roofsecure.net site 24/7. Easily navigate through multiple properties/ facilities. The ability to report any leaks fast and efficiently to us 24/7 via the “Dispatch” tab on your login page. Repairs are time stamped and you are guided step by step through the entire repair process in real time. What Makes Roof Secure Unique? 24/7 online of telephone emergency request. 24/7 access to online building information system. Easy online maintenance request form. Manufacturer notification for warranty repairs. Satisfies manufacturer’s inspection and preventative maintenance requirements. Extended roof life through preventative maintenance. Maintain records for roof modification and repair for liability and tenant relation purposes. Roof Perimeter – Edge Detail, Gutters, Downspouts Joint/Laps, Outlets, Coping, Etc. Roof Surface – Dry Laps, Fish Mouths, Blisters, Deterioration, Oil/Grease Damage, Coating Failure, Mole Runs, Protection Pads, Holes, Cracks/Splits, Expansions, Loose Debris, Etc. Penetrations – Loose Laps, Open Corners, Loose Base Flashing, Sealant, Skylight Issues, Missing Caps, Damaged/Abandoned Equipment, Etc. Visual Building Perimeter – Wall Cracks, Expansions, Holes, Missing Mortar, Paint Flaking, Etc. Why Do You Need Roof Secure? The roof on your building(s) is one of the most important and expensive assets and needs to be regarded as such. Regular maintenance pro-longs the life of your roof. 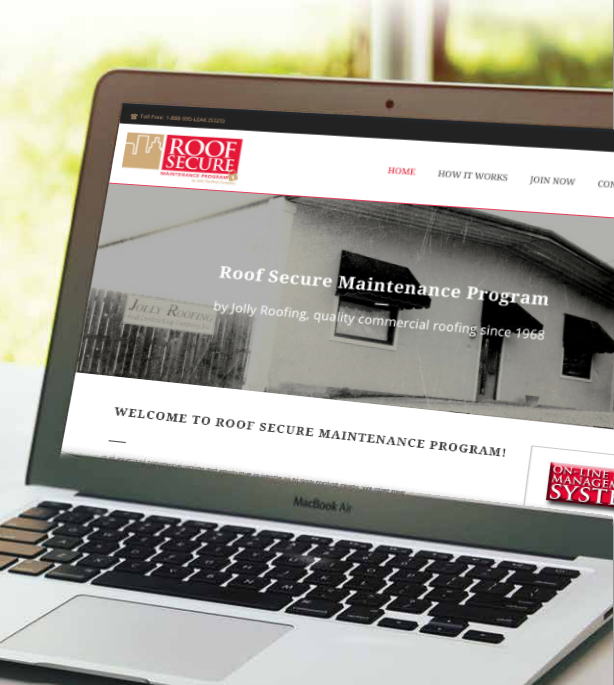 The Roof Secure Program enables you to constantly monitor every detail, eliminating surprise expenses, keeping your building dry, and allowing you to be in full control of your roof!